In a large resealable plastic bag, combine the flour, cornmeal, cornstarch, salt, paprika, oregano, sage and pepper. In a shallow bowl, beat eggs and water. Dip chicken in egg mixture; place in the bag, a few pieces at a time, and shake to coat. In an electric skillet, heat 1 in. of oil to 375°. 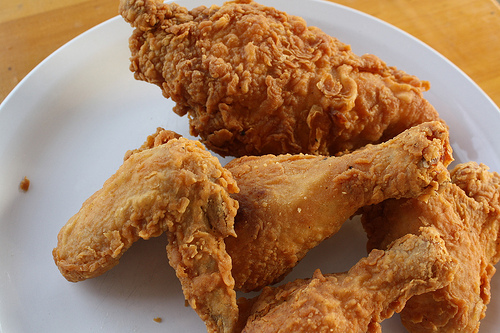 Fry chicken, a few pieces at a time, for 3-5 minutes on each side or until golden and crispy. Place in two ungreased 15-in. x 10-in. x 1-in. baking pans. 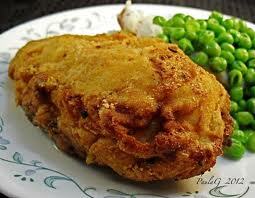 Bake, uncovered, at 350° for 25-30 minutes or until chicken is tender and juices run clear. Yield: 12 servings.